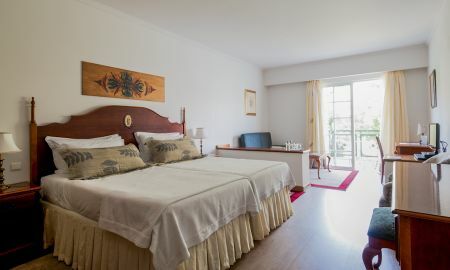 Nestled in the beautiful garden grounds of a historic quinta in Funchal, Quintinha de São João is the perfect escape. The hotel boasts 33 spacious rooms, all featuring state-of-the-art facilities and stunning garden views. With attractive interior design and attentive personal service, it's no surprise that the Quintinha de São João calls itself a "Home from Home". The hotel offers both indoor and outdoor heated swimming pools, a gym, as well as a spa, complete with sauna and Turkish bath, where guests can enjoy massages and aesthetic treatments. Quintinha de São João is located in a residential part of the city, about 1.5 kilometres outside the city centre and 2.5 kilometres from the nearest coastal swimming area. Guests can enjoy breath-taking views of the mountains and the hotel's incredibly extensive garden setting. At only 20 kilometres away from Madeira Airport, Quintinha de São João is the perfect place for visitors to enjoy everything that the island has to offer, from the city to the sea. For flexible rates, 100 percent of the first night will be charged by the hotel anytime after the booking.